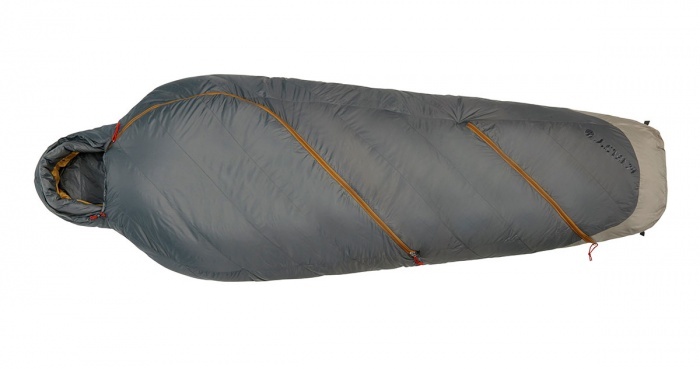 Zippered vents are the name of the game in the Kelty Sine, a 35-degree down sleeping bag, great for those with sweaty toes. As the temperature pushed past 80 degrees, the last thing I wanted to do was get inside a mummy-style sleeping bag. Thankfully, I didn’t have to, at least not all of me. 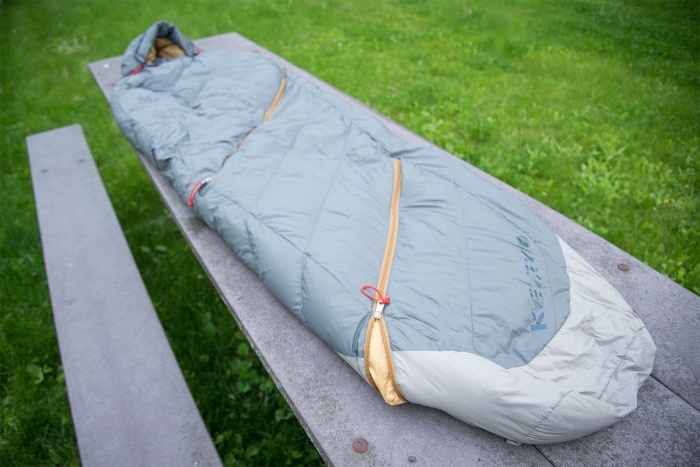 Kelty adds a twist to conventional sleeping bags with a dedicated zipper just for your feet. The Sine boasts some serious venting with a zipper that cuts diagonally across the body, and another near the shins, so your feet can breathe. Now, 80-degree summer nights are no place for a 35-degree bag, so we also tested the Sine in its appropriate range. On weekend camping trips during spring and early summer, the wilds of Minnesota proved formidable testing grounds, with temps dipping into the mid-40s. The first thing I noticed when looking at the Sine were two sets of zippers. One running diagonally across the feet. Another diagonally across the torso and up to the shoulder. When my body was too warm, or I suspected I’d get sweaty at night, I stuck my feet out and went to sleep. 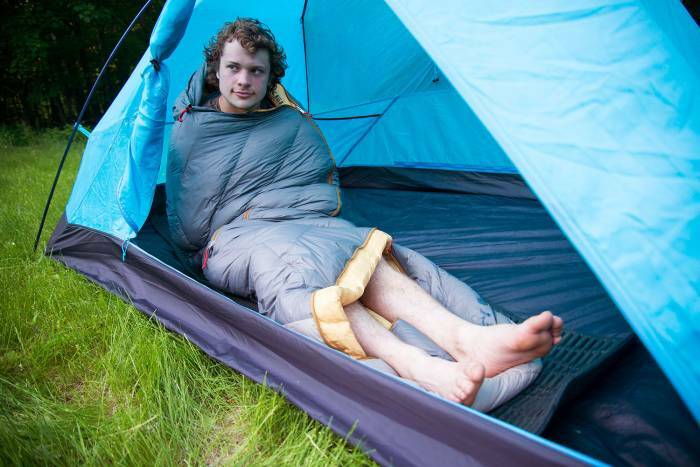 It works as you’d expect, much like sleeping with your feet out of traditional side-zip sleeping bags. The Sine, however, is built around this feature. 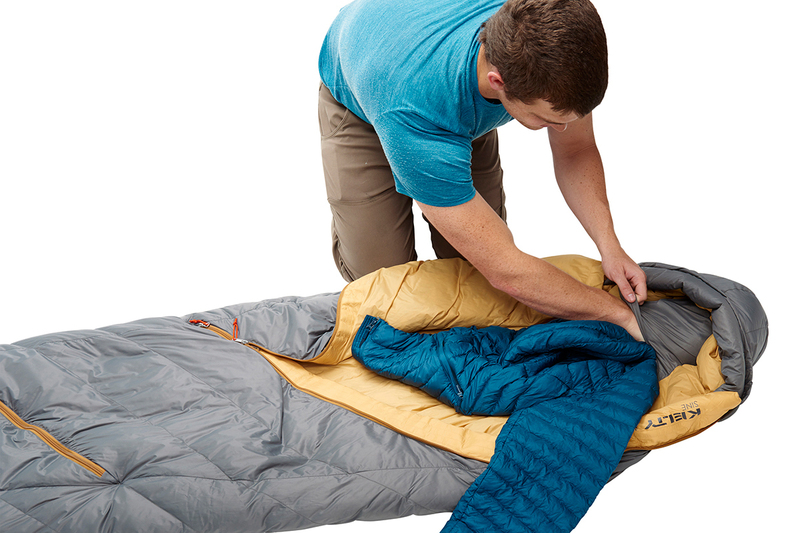 Poking my feet out of traditional sleeping bags leaves an unused clump of material at the bottom of the bag. This causes traditional bags to twist and become uncomfortable. With the Sine, my feet lay on a bed of soft down, and the bag stays in place. Conveniently, Kelty’s diagonal torso zipper can zip from inside or out, and moves naturally with the body’s contours. And the zipper didn’t catch on the bag’s surface material. Lying on the Sine, I was impressed at how soft it was. The 20D nylon taffeta fabric feels luxurious and cool to the touch. Much like extremely high-thread-count bed sheets. The bag fits tightly around the upper body when fully zipped up, but it didn’t affect my sleep. Beneath the hood is a pocket, ideal for stuffing puffies for a makeshift pillow. On top of the nylon fabric, the 800-fill power DriDown helped make the Sine one of my now-favorite sleeping bags. A compressible stuff sack and mesh storage sack come with the bag. It’s rated down to 35 degrees, although I’d recommend this bag for warm summer nights as well. With a retail of $240, it isn’t too spendy, either. For a unique sleeping experience, or for those tired of waking up with clammy toes, check out the Sine.